When I interviewed Dan Abrams last year about his new media news and analysis blog, Mediaite, he indicated that he has ambitions of building a Mediaite mini-empire by expanding to other verticals. Abrams announced late last year that he has a definitive plan for this, with sister Mediaite sites covering style and fashion, sports and technology. 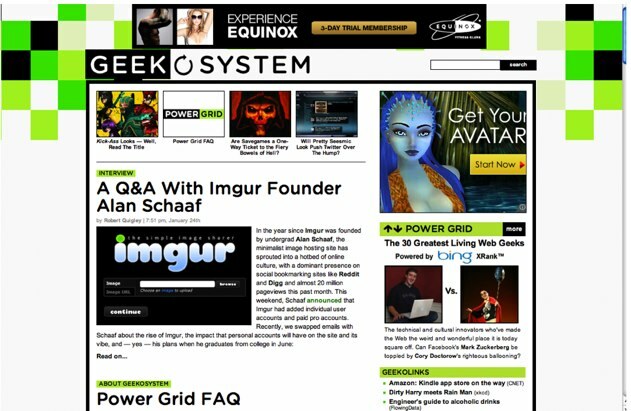 Today, Abrams’ venture into tech news and analysis, Geekosystem, has launched. Geekosystem aims to cover what Abrams calls “geek culture,” which includes tech news, movies, science fiction, video games, superheroes in comics, and more. The audience is all those “nerd” who don’t necessarily work in technology or have a deep understand of the industry, but want to catch up on the latest trends and news. Original content includes everything from reviews of gadgets to details on the latest sci-fi movie. And the site will also add a dash of traditional tech news coverage, so expect to see mentions of Twitter and Facebook. But by and large, the site will have a mix of coverage and won’t be primarily focused on covering the startups and tech giants that we report on here at TechCrunch and other tech news blogs, says the site’s editor Robert Quigley. Content will be supplied by the site’s two editors, an intern, and a range of contributors. Additionally, the site will aggregate top tech and geek stories from around the web. 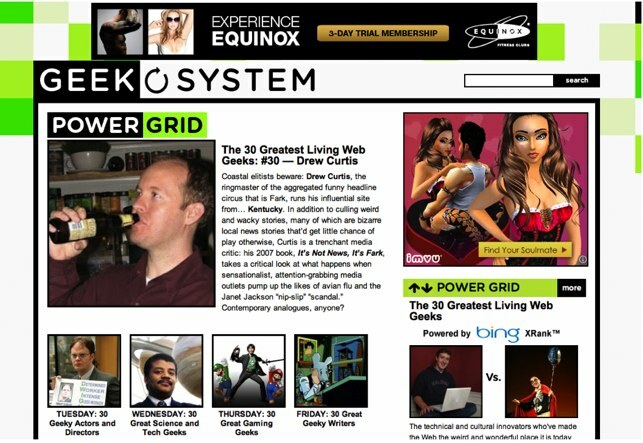 Geekosystem will off course feature a technologized version of Mediaite’s trademark Power Grid, which ranks and indexes media players based on news, analysis and events on a weekly basis. Geekosystem’s grid includes the obvious; Mark Zuckerberg, Bill Gates, Sergey Brin and Larry Page. And Michael Arrington also makes an appearance. The site’s design is basic, which isn’t surprising considering that Mediaite’s UI is fairly simple. Will Geekosystem succeed? Abrams has had considerable success with Mediaite the past year, with the site making Technorati’s top 40 blogs list. And the startup expects to turn profitable this year. But the “geek news” space is considerably more crowded than the media news arena, and Abrams might find himself fighting with both tech and gadget blogs for traffic. But that being said, I like Abrams’ “pop culture meets geek culture” ambitions for the site and it could gain a following based on the quality of its coverage. The site is already getting a vote of confidence from one of the biggest players in the tech space, Microsoft. The tech giant is going to be the exclusive advertiser (for Bing) on Geekosystem for a full two weeks.